On 3-6-18, the Legislative Fiscal Division released FY 2018 General Fund Revenue Update #3 3-6-18, showing "year-to-date median collections compared to historical collection patterns indicate total general fund collections of $2,439 million, about $4 million more than the HJ 2 estimate for FY 2018. Using the cash concept model, current collections suggest a potential revenue overage of about $13 million." This is better news with cautions given ..."Although year-to-date estimates through February are suggesting final revenue collections similar to HJ 2, this may overstate revenue due to timing of tax payments. Under the Tax Cuts and Jobs Act of 2017, the federal deduction for state and local taxes is limited to $10,000 starting in 2018. Taxpayers may have made individual income and property tax payments earlier in the fiscal year to maximize federal deductibility." OPI released the FY 2019 Peliminary Budget Data Sheets on 2-26-18. 2018-19 General Fund Budget Overview Worksheets for the overview. The Preliminary Budget Data Sheets are posted at the following link: CLICK HERE. The General Fund Budget Excel Spreadsheet is posted at the following link: CLICK HERE. (Note: Please download this current version of the spreadsheet to your computer (right-click on the link and choose "Save Target As" to save it to your desktop.) Previous versions of the spreadsheet are no longer applicable for preliminary budget purposes. On 1-18-18, the Montana Department of Revenue revised the estimated impact of federal tax reform on the state general fund. The estimate is $19.9 million for the 2019 biennium, down from the $46 million previous estimate. The LETTER and Gazette Article explain the details. On 1-10-18, the Legislative Fiscal Division released FY 2018 General Fund Revenue Update 1-10-18 interpreted in THIS Independent Record Article. Click 2017 Legislative Special Session (November 13-16, 2017) to review the Special Session. On November 6, 2017 at 2:00 Governor Steve Bullock announced the call for a Special Session of the Legislature to begin at noon on Tuesday, November 14, with hearings beginning on November 13. For background read Special Session Call Governor Remarks 11-6-17 and Proclamation - Call for 2017 Special Session. Click IR Article - Governor calls lawmakers back for special session, releases list of cuts to state agencies 11-6-17 to read about the announcement. The MT-PEC partners met with the Governor on November 3, 2017 to understand the state-wide issues and the need for the special session. The MT-PEC partners have adopted a unified position statement, MT-PEC Partners Special Session Statement 11-6-17, to assist our collective members in understanding the issues and to assist in the effort that will be necessary during the special legislative session. The proposed budget reductions impacting the state are found in Balancing Montana's Budget Legislative Proposals Special Session 2017 11-6-17 with the details of all of the proposed cuts outlined in 2017 Special Session Proposed Cuts Equals 76 million 11-6-17. 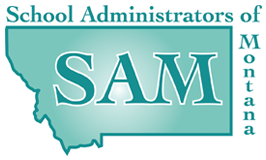 SAM intends to keep the 2017 Special Session webpage updated throughout the 2017 Special Session and to assist our SAM members with their understanding of the issues and the advocacy necessary to maintain quality public schools during the shortfall in state revenue. *Click OPI Materials from LFC Meeting 10-4-17 to see what was presented to the Legislative Finance Committee. *Independent Record 10/5/17 Article reporting on the actions taken by the Legislative Finance Committee. On 1-22-18, Governor Bullock established an Executive Order that addresses the Montana's stance on Net Neutrality for state procurement contracts - Media Release. On 1-24-18, The National published this Article about Montana's stance on Net Neutrality. 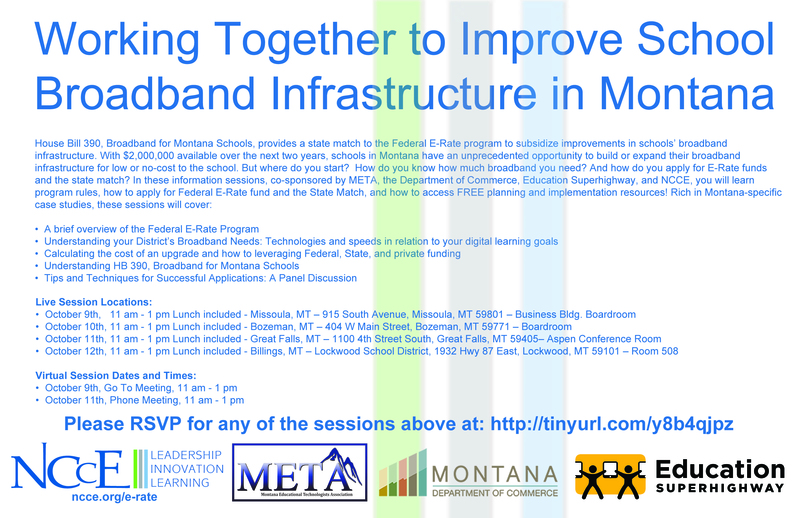 The Broadband for Montana Schools Program enables schools to upgrade their broadband, boosting access to high-speed Internet and providing students with more digital learning tools. Free resources from partners in the program are available to all school district leaders at no cost to support schools in upgrading their network this year. New Education Super Highway Webinars with tips and best practices to help K-12 leaders navigate the E-rate cycle and learn how to use their free tools, resources, and programs.